Lignite Tour is a reputable bus company in Thailand founded in 1986. The bus operator has been serving travellers and tourists in Thailand in this competitive industry for the past 30 years. Lignite Tour has a sub-brand called Lignite Tour North that focuses on providing bus routes to and from Chiang Mai. Chiang Mai is known as the largest city in northern Thailand which means "new city" after it was renamed and became the new capital of the Lanna Kingdom in 1296. If you have never been before, here is a good chance to take a trip to discover the city with your family and friends when you book bus tickets with Lignite Tour North on Easybook website. Lignite Tour North is using double decker buses to serve the route from Bangkok to Chiang Mai and also its return route. The double decker buses come equipped with 38 seats that uses the "2+2" seating arrangement. Their bus coaches are fully air-conditioned so that every passenger will be able to enjoy the cooling and relaxing ambience on the comfortable seats. Riding with Lignite Tour North will make you feel like you have your money well-spent on the bus ticket. As mentioned before, Lignite Tour North is only offering bus route from Bangkok to Chiang Mai with return route too. The pick-up or drop-off point is located at Bangkok Bus Terminal (Chatuchak). Bangkok Bus Terminal (Chatuchak), as known as Mo Chit Bus Terminal or Northern Bangkok Bus Terminal, is the largest bus station in the city. The main building of the bus terminal is a 3-storey building that resembles an arc shape. The bus terminal is located on Kamphaeng Phet 2 Road (north of Bangkok) near the back end of Chatuchak Weekend Market and is easily accessible as it is just a few minutes away from Mo Chit BTS Skytrain Station. If your pick-up or drop-off points are in Chiang Mai, you will need to be at Chiang Mai Bus Terminal 2 (Arcade). 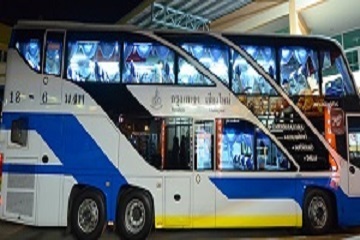 The bus terminal is located on Kaew Nawarat where it is just a few kilometers away from the city center. Chiang Mai Bus Terminal 2 (Arcade) is one of the main stations for travelers in northern Thailand. Please take note that there is another bus terminal (Chiang Mai Bus Terminal 3) right next to Chiang Mai Bus Terminal 2 (Arcade), so make sure you are at the right one. When you do plan a trip to the northern Thailand, go ahead and grab a Lignite Tour North bus ticket to begin you journey to Chiang Mai with ease. It is so convenient when you can book Lignite Tour North bus ticket online at Easybook, so do it now! 999/12 Moo. Kamphaeng Phet 2 Road, Chatuchak, Bangkok 10900.